The lovely blooms of the water hyacinth can turn a waterway into a tangled mess. 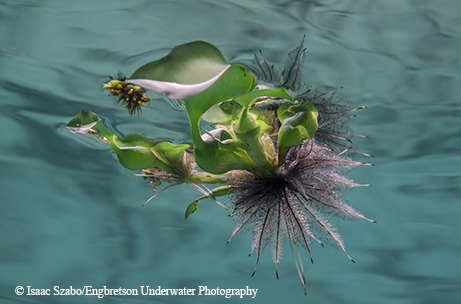 This floating plant rides the surface of lakes, creeks and slow-moving rivers. It’s deceptively pretty, with roundish waxy leaves and tall spikes of lavender flowers. The swollen leaf stalks (petioles) contain lightweight spongy tissue and work like pontoons, keeping leaves and flowers afloat while fibrous roots dangle in the water. In wetlands, water hyacinth may root in shoreline mud. It can reproduce by seed or by sending out horizontal stems called stolons. New plants arise from nodes along the stems, forming dense mats that can strand boats. Some plants eventually break free to start new colonies, spreading lakewide and covering entire coves if left unchecked. The species arrived in the United States via a display at the 1884 World’s Industrial and Cotton Centennial Exposition in New Orleans. By 1896, mats of water hyacinth were blocking steamboat docks in Florida. It spread quickly in the southeastern states, and now invades fresh waters all the way to California. John Findeisen, TPWD invasive plant specialist, says that with no hope of eliminating this pest, the agency focuses its efforts on managing the state’s worst infestations. This year, TPWD and its partners are fighting water hyacinth on Houston-area creeks and bayous, Central Texas rivers and half a dozen lakes. Record legislative funding is helping in the war against water hyacinth. Lawmakers in the last legislative session appropriated $6.3 million to address aquatic invasive species. Besides interfering with boat traffic, water hyacinth is a huge consumer of water. All green plants draw water up through their roots and release it as vapor from their leaves. Water hyacinth has an evaporation rate three to 12 times that of open water. “In a drought-stricken area, that can lead to serious water loss,” Findeisen said. There’s a weevil that feeds on water hyacinth, but it doesn’t do enough damage to restrict growth or eliminate the plant. At this time, herbicides, shredding and physical removal are the only integrated pest management techniques that provide effective control of the plant. Don’t spread it! It’s illegal in Texas to possess or transport this plant. Clean, drain and dry your boat before leaving a lake or river. Act locally. Individuals or groups can apply for a $27 Aquatic Vegetation Removal Permit that allows them to remove water hyacinth from neighborhood lakes and ponds.